The massive number of devices warrants more developers than will be available. It will be up to tools to close the gap, with citizen programmers becoming more prominent. 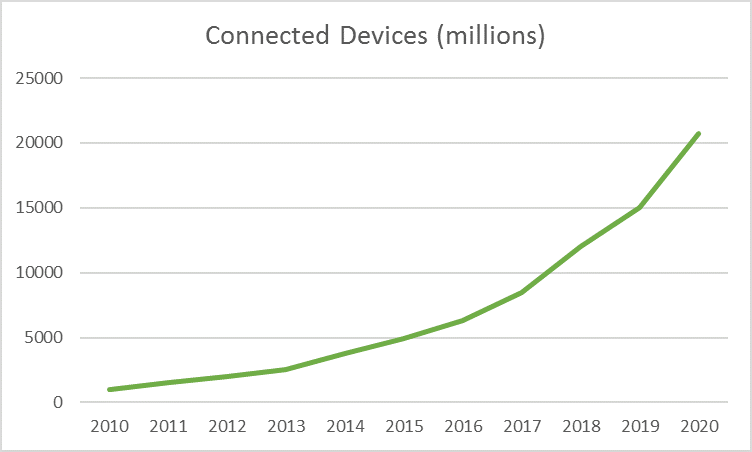 With the Internet of Things (IoT) transformation, it’s obvious that the number of connected devices in the world is increasing rapidly. Everywhere around our daily lives, we all use more and more of them. In addition to being connected, more devices get equipped with a touch screen and a graphical user interface. We have all seen this around us, and many developers are also deeply involved in creating software for these devices. To bring in some numbers, the Gartner group has estimated that the number of connected devices will grow to a whopping 20.7 billion by 2020 (and some predict even higher growth, up to 30 billion devices). Not only is the number of devices growing, but the complexity and amount of software is also increasing rapidly. For example, today’s passenger car can have over 100M lines of code, and this is expected to triple in the future as the functionality of automotive software increases. Cars are on the high side of complexity, but even the simplest connected devices need a lot of software to be able to handle the requirements for connectivity, security and to match the growing usability expectations of consumers. What is inside these devices? What kind of software drives the connected devices? What kind of skills are needed to build these? It is estimated that 95% of today’s embedded systems are created with C/C++, and that this is not significantly changing in the foreseeable future. Then, on the other hand, according to a study there were 4.4M C++ developers and 1,9M C developers in 2015 in the World. An older study by IDC from 2001, shows that the number of C++ developers was estimated to be 3M back then. 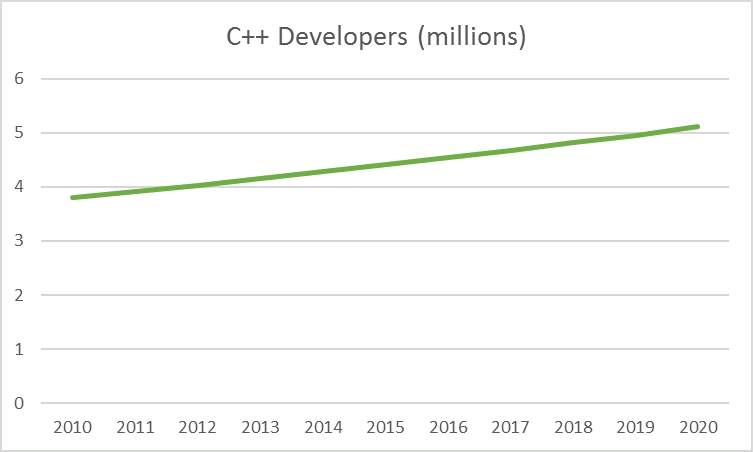 This means the number of C++ developers has been growing steadily around 3% per year and is expected to continue with a similar trend – or at least within a similar range. The estimated number of devices, most of which will be done with C and C++, is already growing with much faster pace than the amount of C++ developers and the growth is expected to get even higher. Due to the increased complexity of functionality, the amount of software needed in the devices is also growing. Although some of the new devices will be very simple in functionality, on average, the devices get more and more complex to meet consumers’ requirements. Now, comparing these two trends together gives us an interesting paradox: How can the few million C++ developers match the requirement to build the dozens of billions of connected devices in the future? So how does this add up? Do we expect a 2020 C++ developer to write 20 times more code than a decade ago? That does not work. Even if all the C++ developers would focus into embedded, with no one creating and maintaining software for desktop and mobile applications, there still may not be enough developers. C++ developers can’t be easily trained from other professionals — programming is a skill that takes years to learn and not everyone can master. So, Something needs to be done to facilitate two things: Enabling C++ developers to be more productive and also helping non-C++ developers create the devices. Therefore, the approach for creating embedded software needs to be adapted to the new situation. The only way to cope with the growth is to have good tools for embedded device creation and to increase the reuse of software. It is no longer viable to re-invent the wheel for each product – the scarce programming resources have to be targeted into differentiating functionality. Organizations will have to prioritize and focus into where they add value the most – anything that can be reused should not be created in-house. Using tools and frameworks like Qt is the only viable approach to create the envisioned devices. The old Qt tagline: “Code less. Create more. Deploy Everywhere” is more relevant today than it has ever been. It is likely that even reuse of software assets is not enough. It is also necessary to increase productivity of the C++ developers and to extend the personnel creating the software beyond the ones who master C++. With the QML language, visual UI design tools and functionality for embedded devices does not mandate C++ skills for every developer in the team. It will still be necessary to have core C/C++ developers when making embedded devices, but others can help as well. Using Qt allows both non-C++ developers to create some of the needed functionality and the C++ developers to be more productive. To increase developer productivity and to extend the developer base, Qt offers otherwise unseen ease of embedded development. Qt provides many of the common development boards supported out of the box, one-click deployment to target devices, built-in device emulator, on target debugger, performance analyzer, visual UI designer and many more tools in the integrated development environment. 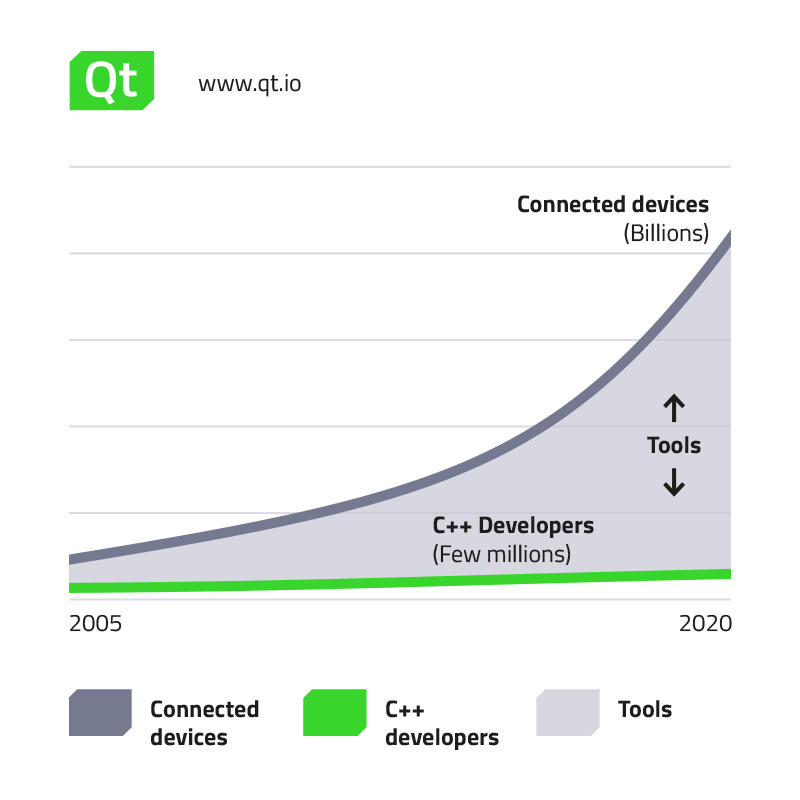 With the integrated tools and extensive API functionality, developing with Qt is unlike traditional embedded development.